Facebook was charged Thursday with discrimination by the U.S. Department of Housing and Urban Development because of its ad-targeting system. The civil charges filed by the Department of Housing and Urban Development could cost the social network millions of dollars in penalties. But more than that, they strike at the heart of Facebook’s business model—its ability to deliver ads with surgical precision to certain groups of people and not others. Just last week, Facebook agreed to overhaul its targeting system and abandon some of the practices singled out by HUD to prevent discrimination, not just in housing listings but in credit and employment ads, as well. The move was part of a settlement with the American Civil Liberties Union and other activists. Ives said the move could mean U.S. regulators are taking broader aim at the digital advertising market. “This is a clear shot across the bow for Facebook and others,” he said. In its settlement with the ACLU and others, Facebook said it will no longer allow housing, employment or credit ads that target people by age, gender or ZIP code. It said it will also limit other targeting options so ads don’t exclude people on the basis of race, ethnicity and other legally protected categories, including sexual orientation. Janesville Craig’s Emma Blaser is tagged out by Parker’s Alli Rosga during their game at the Janesville Youth Sports Complex on Thursday. Parker defeated Craig 4-1. Artist Deedee Morrison, left, speaks with Stefanie O’Keefe of CODAworx while exploring the ARISE Town Square on Thursday in downtown Janesville. Deedee Morrison discusses the potential of the ARISE Town Square on Thursday in downtown Janesville. To Deedee Morrison, Janesville’s downtown exudes vibes of Albany, Oregon. The similar-size West Coast city has received public and private dollars to revitalize its downtown and emphasize the Willamette River as an asset and gathering space. Morrison, a Greenville, South Carolina, artist, has worked on projects in Albany and has seen how public art can transform a city. 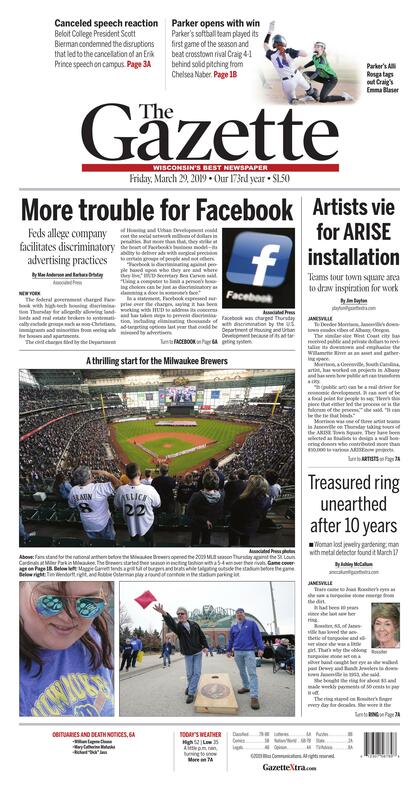 Morrison was one of three artist teams in Janesville on Thursday taking tours of the ARISE Town Square. They have been selected as finalists to design a wall honoring donors who contributed more than $10,000 to various ARISEnow projects. The mini tours allowed each artist to see the town square and visualize how they could incorporate their wall designs into the space. Many cities are putting a greater emphasis on public art. Some places buy artwork not specifically designed for their city, or they work with an artist who has never visited the city. Morrison lauded the ARISEnow team, a public-private downtown renaissance group, for bringing the artists in for a visit. The strongest public artworks come from artists who understand a community, she said. Stefanie O’Keefe of CODAworx, a liaison company facilitating communication between ARISEnow and the artists, said these relationships between Janesville and the artists are important. Only one artist will design the wall, but the rest could help design other planned ARISEnow art projects. JoLynn Burden, ARISEnow’s development and community engagement director, wrote in an email to The Gazette that art will be integrated into the pedestrian bridge spanning the Rock River. Sculptures will stand at each end of the bridge to block traffic. A future riverwalk south of Court Street on the river’s eastern shore also will have artwork. ARISEnow already unveiled one major artwork last year when the interactive fountain opened. Artist Ed Manner said the fountain’s steel design and other steel objects at the town square give the area a strong brand. Manner and his sister Anne Manner-McLarty are finalists for the donor wall design. Manner-McLarty, of Asheville, North Carolina, said the Rock River is “bigger and more beautiful” than she was expecting, giving the town square a natural feel. For the third finalist, Bonnie Rubinstein of River Falls, the river is a key downtown amenity that is already becoming a gathering space. She saw kids playing at the interactive fountain Wednesday night. The Rock River is where Janesville began. As new industry dominated the area, the city downplayed its connection to the river and lost that relationship, Rubinstein said. But now the river is becoming a focal point of downtown. The pedestrian bridge will connect both shores, and new bridges on Milwaukee and Court streets will improve the area’s infrastructure, she said. Rubinstein is “very impressed” with and could feel the energy behind Janesville’s downtown revitalization. The river was central to that momentum.